Johannes Lecküchner was a priest living in Franconia during the 15th century. 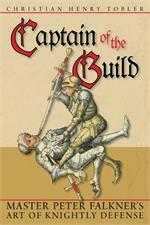 His surviving books contain a wealth of information on the German fencing style of this era. His system Although based on the Liechtenauer tradition, his system is a veritable treasure of martial instruction, ranging from bladework to disarms and wrestling techniques. Many of these techniques can be applied with the longsword as well and give a valuable additional data-point to the standard Liechtenauer repertoire. Beside techniques for earnest fighting, Lecküchner also detailed antagonistic techniques that designed to electrify an audience at fencing events. This DVD is a comprehensive training guide, laid out in an easy to follow manner. After introducing the history of Lecküchner, his fencing system, and the theory of this art, the DVD offers extensive description of footwork, guards and attacks. Then, the six master-strikes follow, which are similar to those in Liechtenauer's longsword. After exploring a choice of intermediate and advanced techniques like disarms, wrestling and show techniques, the DVD is concluded by several solo exercises that build up the most relevant skills in the art. "The Messer of Johannes Lecküchner" is a must-see for all interested in the use of medieval and Renaissance one-handed swords. Longsword fencers will also greatly benefit from this instruction: drills shown in this work can also be performed with the longsword and complement the exercises detailed in the DVD "The Longsword of Johannes Liechtenauer Part I."